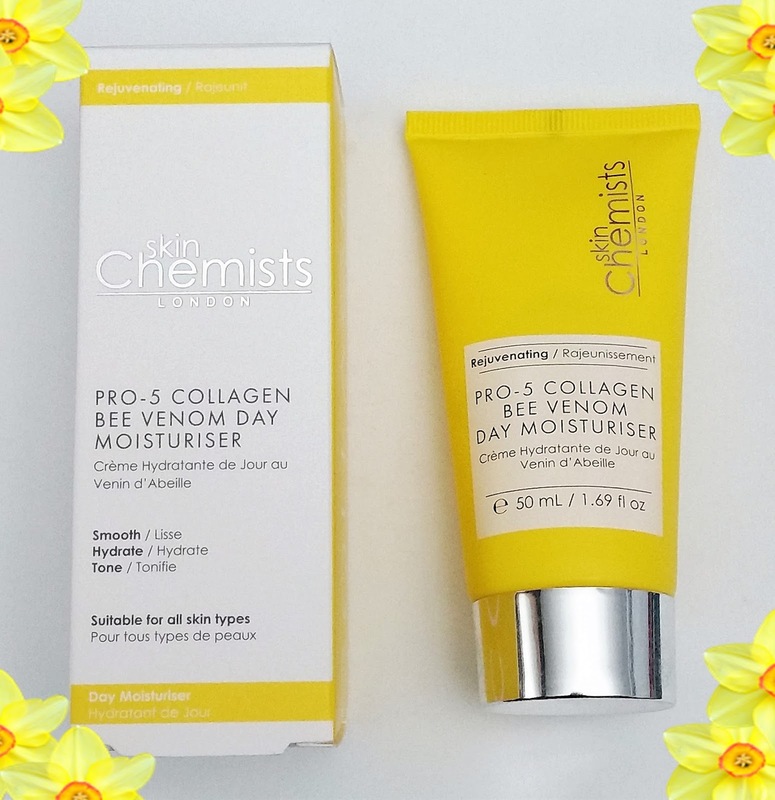 Home / SkinCare / Skinchemists Pro-5 Collagen Bee Venom Day Moisturiser. Skinchemists Pro-5 Collagen Bee Venom Day Moisturiser. The Skinchemists pro-5 collagen bee venom day moisturiser is your multitasking product to include in your skincare regime. Once applied, it aims to keep your skin hydrated and smooth throughout the day, whilst the special ingredient aims to reduce the appearance of fine lines and wrinkles, giving you a more youthful-looking complexion. 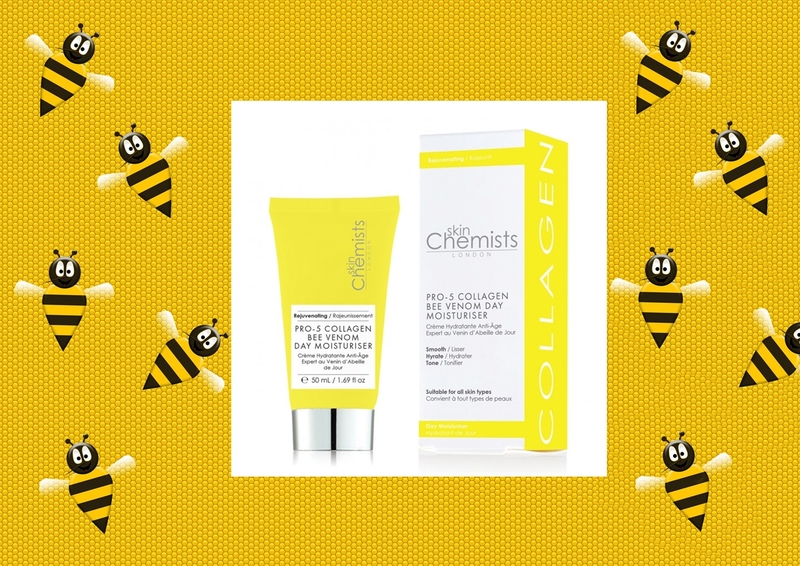 The special ingredient "Bee Venom" stimulates the production of collagen and tricks the skin that it has been stung creating a plumping effect. The other added skin loving ingredient is the highly popular Hyaluronic Acid that moisturises skin helping it look softer and smoother with a radiant healthy glow. 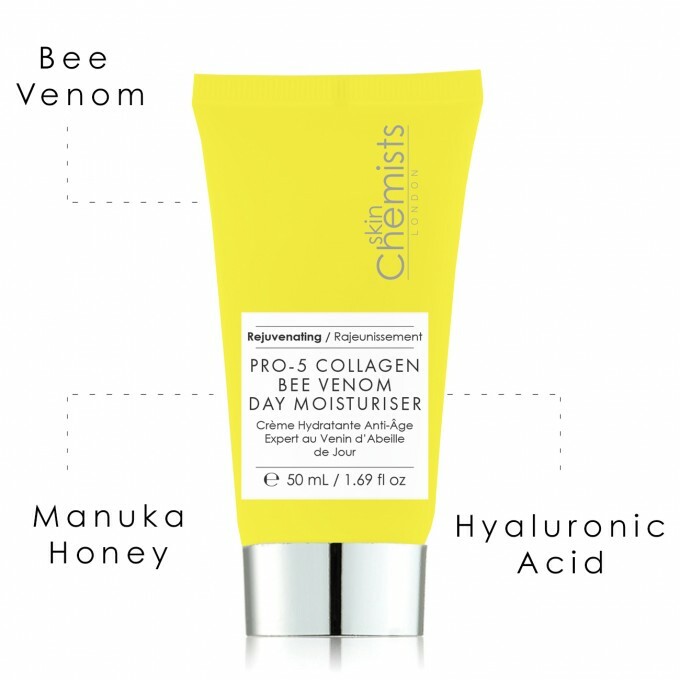 The Skinchemists pro-5 collagen bee venom day moisturiser is Paraben free and the bee venom is ethically and sustainably sourced. It is important to note if you are allergic to bees then do not use this product and it is suggested to carry out a patch test 24 hours before use. Apply to cleansed skin and after your usual serum you use in your skincare regime by dispensing the moisturiser from its squeezable tube. The Skinchemists pro-5 collagen bee venom day moisturiser glides over skin with ease, thanks to its light texture and consistency. You will detect a slight sweet, but pleasant fragrance, as the moisturiser absorbs really quickly to leave a smooth and soft base to your skin. My skin felt hydrated throughout the day without feeling sticky or heavy and there was no high shine that sometimes u can experience from some moisturisers. The added ingredient titanium dioxide does protect skin from UVA and UVB radiation, but application of your favourite sunscreen applies perfect over the moisturiser for added protection. Suitable for all skin types, a luxury moisturiser to reach for when your skin needs a multitasking product, find out more at Skinchemists, X Neil.